That's great information on flooring the consumer.Thanks a lot for sharing it with us.It will keep us knowing the business. Kathleen, I'm pleased to hear you say so. Great post. One thing I would suggest for those in the hardwood industry is to associate themselves with distributors that are members of the Forest Stewardship Council (FSC), or join the FSC themselves, especially if they deal in exotic hardwood. The FSC allows consumers to run checks on the companies they are buying from, and since rainforest depletion is a HUGE environmental problem, many consumers base their buying decisions on whether or not a company is endorsed by the FSC. Check 'em out if you aren't familiar, and keep up the good work! Thanks for sharing that excellent suggestion! Thanks, too, for adding to this conversation. Achieving the greater green includes making it easy for customers to dispose of replaced flooring in ways that help the environment. You touched on this, C. B., when you mentioned repurposing waste. I’d go on a bit with: Is the retailer taking the customer’s waste to recycling centers when allowed? Are replaced flooring and old samples that still have a useful life being donated? Then let the community know what you’re doing to achieve this greater green for the physical environment. But in my opinion, it’s wise to limit what you’re promising to what you’re willing to stay with for the long-term. As you point out in your posting, C. B., consumers are often skeptical of green claims. Consider what’s happened to McDonald’s Corporation. Most objective observers would agree that the world’s largest fast food chain does have the credentials to brag about friendliness to the environment. They were at rank 22 on the Newsweek Magazine 2009 “Greenest Companies in America” list. Even with all that, the food retailer continues to draw criticism for not showing sufficient social consciousness. It seems to me that people are confusing overall social consciousness with specific environmentalism. Last November, McDonald’s Corporation announced that they’re redoing the décor for about 100 of their restaurants in Germany. The change is from a red backdrop to a green interior. The objective, says McDonald’s, is to dramatize their commitment to the environment. Trouble is, they’ve already been changing from red toward green and issuing press releases since at least 2003. 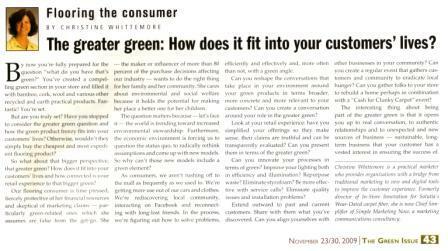 Bruce, you bring up some of the perils associated with making green a marketing platform vs. a core commitment. Thanks for putting the greater green into perspective.